Thank you for your interest in RCHS publishing. Please consider a donation to support our publishing and education programs. Yes, I would like to contribute today! 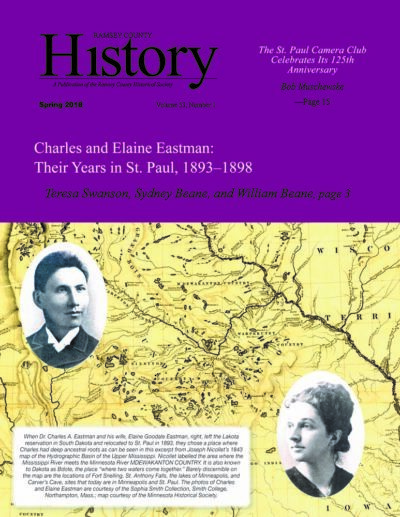 Ramsey County History magazine offers a wide variety of articles on the people, places and history of Ramsey County. Born in 1858 in Minnesota, Charles A. Eastman (Ohiyesa) survived the Dakota War of 1862 and fled to Canada with his family where he was raised in the traditional Dakota way. Subsequently educated in the white world, including medical school in Boston, in 1890 Dr. Eastman was appointed U.S. government physician at Pine Ridge Agency in South Dakota. There he met author Elaine Goodale, a young white woman who was the supervisor of education in the Dakotas. Just prior to their marriage, U.S. Army troops massacred hundreds of Dakota at Wounded Knee, which profoundly affected both of them. The young couple relocated to St. Paul in 1893, which was Charles’s bdote (homeland). He had difficulty making a success of his newly established medical practice; so Elaine encouraged Charles to record stories of his early years, the first such narratives published as personal Dakota accounts. Together, they raised a family of six children, became advocates for Indian causes, and published 10 books. Correction: In the sidebar on page 7 titled “Mahpiya Wicasta and Bde Make Ska” the first paragraph should read that Agent Taliaferro was married to Day Sets (Anpetuinajinwin) not Stands Sacred, who was married to Seth Eastman. The growth and popularity of photography in the late nineteenth century led to the founding of the St. Paul Camera Club (SPCC) in 1893. Over the years, the number of members of the SPCC has varied, but it is still going strong today and is considered the oldest camera club in Minnesota and the fourth oldest in the United States. Initially membership was open to amateurs and professionals, both men and women, and dues were modest. The typical activities of the SPCC today involve salons, educational programs, outings, exhibits, and external competitions. Amateurs make up its current membership, but the goal of the men and women of the SPCC has remained the same: to provide a venue for individuals who are passionate about photography to learn more and to make great photos. In 1969 demolition of St. Paul’s Federal Courts Building and Post Office, a Richardson Romanesque Chateauesque-style public building that the federal government had constructed between 1892 and 1901, seemed imminent. When a new Federal Courts Building was constructed in 1961, the building now known as the Old Federal Courts Building became surplus property. A combination of citizen leaders and public officials stepped up, however, and saved the building. Their initial action was to get the building added to the National Register of Historic Places (1969). They also organized Minnesota Landmarks, a nonprofit led by Elizabeth (Betty) Musser and Georgia DeCoster. Their goal was to preserve the building. The resulting public-private partnership helped convince the federal government that the building could be restored and become the home for a variety of arts and science organizations that were then located elsewhere in the city. Ownership was transferred to the city in 1972. Now owned by Ramsey County, Minnesota Landmarks supervised the restoration work (completed in 1978) and operates the building today.